Ask fellow campers about "Moonshine Creek Campground" and nearby attractions. Owners are great, they work very hard to keep the facility looking great. This is our fourth stay here. if you are looking for a quiet, wooded experience in the mountains this is it. 11/2 miles off Blue Ridge Parkway. Bath rooms showers are beautifully tile and very clean. The creek puts us to sleep at night. There are two access points where you can sit on a bench in the creek or Wade. We looked at several sites before choosing this campground. We camped at Moonshine Creek Campground in a Travel Trailer. A little crowded for us, but we were on the end by the creek and got over it and by day 2 really enjoyed the park the rest of the week. Great, friendly staff...and neighbors. Beautifully nestled in a valley along a small creek, near Sylva or Waynesville if you need major items or entertainment. Also near an entrance to the Blue Ridge Parkway. New bathhouse/restroom/laundry building. Heated. Loop roads may be a little challenging to big rigs, but this park is worth it. Most sites have sewage. Dump station available. Nice quiet park. Will return next fall. We camped at Moonshine Creek Campground in a Motorhome. This park is close to a Blue Ridge Parkway entrance. Go there. A Great Smoky Mountain entrance is a short drive from there. Visit Lake Junaluska complex. Interesting. You will love it or hate it. If you love woodsy sites (cool and shady when hot and sunny, gloomy when raining), the sound of a creek, and a spotless bathhouse, you will love it. If you value your privacy, want to wade in the creek, or have a big rig, not so much. We enjoyed it for a short stay hanging out, but would look elsewhere for a longer, sightseeing type vacation. Put your feet up and relax type campground. Sites too close together for us, but as it is quite busy, definitely a personal preference. Would love to see owners create a few 'super sites' - more space at a higher cost. We'd pay it. We camped at Moonshine Creek Campground in a Motorhome. Thank you for your review of Moonshine Creek Campground. We appreciate campers feedback and have plans to add some additional larger sites for the big Motorhomes and Fifth Wheels. We added sites 75 and 76 which have been very popular with the larger campers and have also updated all of our electric boxes with new 20/30/50 amp boxes at every site to also accommodate the larger units. 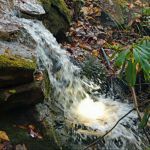 Moonshine Creek is a beautiful campground in a quite cove in the Smoky Mountains and our first priority is to maintain the natural environment, trees, creek, plants, and animal species. We don't like to take trees down so this does limit us a little. Lucky for us most people Love It check back with us or ask for 75 or 76 if you want a little more room. A very nice campground. All sites back up to the creek, plenty of trees for shade. Well manicured. By far the nicest bath house we've encountered. The sites are on the small side. I had just enough room for the travel trailer and the truck had to be parked sideways pretty close. This certainly wouldn't keep us from staying there again as we have already booked it for September. We had pretty much no Verizon service at all. We paid $3/night extra for "cable" hook up. I think it consisted of about 13 channels. We camped at Moonshine Creek Campground in a Travel Trailer. This is gorgeous country. Be sure to check out Bryson City and Nantahala Gorge which are fairly close by. Sylva has most of what you will need as far as Walmart and such. It's about 20 minutes or so away. I stayed here with my family in fall 2017. We were very disappointed with the campground. Would you believe that the campground owner's vehicle slammed into our parked minivan, almost hitting myself and my small child? Their insurance would NOT cover all of the damage!! (Even though the owner accepted fall responsibility in writing). And the campground owner would not pay for the hundreds we now have to spend getting our van repaired!! This shows a sad lack of character. In addition to this , some of the cabins were very, very close together and not level. We were afraid to use the decks because they didn't seem sturdy. The roof on our porch was decaying and falling apart. Although we stayed in a cabin, we noticed that the camper sites were practically on top of each other. Who wants to camp with their neighbor 10 feet away?? The tent sites were mainly along the main road in the campground, so tent campers have to listen to traffic all day long. STAY away from this campground....you literally can't afford to go there! We camped at Moonshine Creek Campground in a Cabin. We are very sorry for any inconvenience that may have been caused to you by Jim's tailgate scratching the rear bumper of your minivan. Our insurance company has replaced the entire rear bumper at no cost to you in a timely manner. Because the accident was so minor and only to the bumper the other repairs that you inquired about having repaired at our expense unfortunately would not be covered. USAA is a nationally known and respected insurance company for Veterans and retired military and we stand by their decision to only repair the damaged part of your vehicle. Other than the park being small. It is one of the best run I've visited. Convenient to towns if needed. Would go back asap but their is so much to see that I haven't. We camped at Moonshine Creek Campground in a Travel Trailer. This is one of the nicest parks that we've stayed in on this trip (7 different ones in 3 weeks), bathrooms, staff were great, sites were great, had a great time. There was no breaker at the power box on site. We camped at Moonshine Creek Campground in a Travel Trailer. Wow, we really enjoyed this lovely little campground. The campsites are on both sides of a babbling creek. There are a few places set up to put your feet in the creek, or let your dog go wading. They don't want people breaking down the banks of the creek, so they supply access points for you. The bathrooms are incredible, tiled, modern and clean. There is a sofa in the laundry area. We got to select our site from the 3 available for our size unit. Our campsite was reasonably level and the utilities were convenient and worked well. The camp host helped us back in. We really loved this campground, and if we hadn't been driving the Blue Ridge Parkway from end to end, we might have chosen to dally here a while. It is just a bit off the BRP. Call and ask for directions to get there, the route is a bit windy. We camped at Moonshine Creek Campground in a Motorhome. This is a cool little campground. It's really good, but could easily be great. It has everything one might need: full hook-ups, cable, clean bathhouse, pretty location, etc. The list goes on and on. There are a lot of positives, so don't let my comments deter a visit. This could turn out to be your favorite campground in the world. My only complaints are that it feels cramped, and as such is a little pricey. We are in a 24-foot Class B. There isn't much privacy on most of the RV sites. Our fire ring was an afterthought, it seemed. Eliminate every other site, fill-in the spaces with native plants, and it would be an extraordinary, unique, and not-to-miss campground. I realize that not everyone cares about such things, and since the campground is obviously popular, I wouldn't expect this to be occurring anytime soon. We visited this campground while traversing the Blue Ridge Parkway. The campgrounds directly on the Parkway itself don't have hook-ups and we had a freezer full of frozen food, so we ventured off for 3 nights. It made an excellent base-camp to explore along the Parkway. We could have easily stayed longer and would have been tempted to do just that, were the price a bit lower. Say $30 instead of $45. We hope to return in the future. 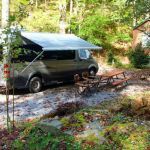 We camped at Moonshine Creek Campground in a Motorhome. We had quite a bit of rain while here but the site handled it fairly well. The bathroom/showers/laundry facility were very clean and outstanding (all tiled nicely). The owner took us right to our site and provided excellent precise backing advice that guided us into our site without any issues (he was the best of our 51 night trip in retrospect). Very friendly owners. We camped at Moonshine Creek Campground in a Fifth Wheel. We traveled to Clingmans Dome and Dollywood theme park from here as a base. Was there to Ride the Blue Ridge Parkway and visit Asheville. Nice out of the way location had a great site on the creek. A beautiful old campground thats about finished getting some needed upgrades. Showers/bathrooms were very nice for any campground. Our site was not that level but then again nothing is in the mountains. Very near the Parkway maybe 2-3 miles. Kind of pricy but well worth it over where we've been before in the area. Owner on site at least part of each day and very helpful when we arrived. We camped at Moonshine Creek Campground in a Travel Trailer. We loved the Blue Ridge Parkway but Asheville downtown has gotten a bit overgrown with strange druggie street people and pan handlers everywhere. Still nice to visit. The Biltmore estate even better than I remember from 15-20 years ago, now has a winery and shops to visit. The reason for low score is because they do not have it on their website or in their rules that you are not allowed in the creek. We found out when we were setting up. If we had known that, we would have chosen one of the many other campgrounds nearby. Also, their website and brochure shows they have wifi, but they do not. Many campers complained about both of those. The campground is nice but not big rig friendly, and sites are really close. The owner is annoying but the camp hosts are great. If you are looking for somewhere to just sit in your camper, this place will be fine. We camped at Moonshine Creek Campground in a Travel Trailer. Not allowed to wade in the creek. Power was out when we arrived - not their fault. It was restored by the power company a couple hours later. Folks in office were not particularly friendly or glad to see us. The lady who helped us back into our site was very nice and helpful. We backed up to the creek which was grown up on the sides so you couldn't really get your feet wet, but the sound was great! The sites are really packed in along the creek. Very little space between you and your neighbor. They have created an odd little water feature of various shallow rock pools that are full of rotting leaves, so you can't wade in them or fish in them...strange. On our second day, we asked if we could extend our visit by a couple of days and were told we would have to change sites - someone was coming for our site. So, we packed up, hitched up, unhooked and moved around the corner. No one ever took the site we had to vacate. No explanation. Rude. One of our major problems was when we tried to sit outside, there was and occasional whiff of sewage. I still don't know where it was coming from, but it was there the whole time. If I were you, I'd look elsewhere. We camped at Moonshine Creek Campground in a Travel Trailer. Lots to do in this area - rock mining in Franklin, shopping and dining in Waynesville and Maggie Valley, gambling in Cherokee, Parkway, etc. This campground is top-notch.The bathroom/shower were the cleanest ive ever seen. The staff was very friendly,the place was absolutely beautiful.I would recommend anyone to stay there, Cant say enough!!!! We camped at Moonshine Creek Campground in a Cabin. Biltmore is the best ,wheels through time is great!!! 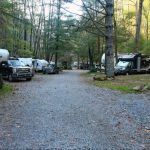 Karen thanks for the taking the time to write such a nice review of Moonshine Creek Campground. We really appreciate our campers and are glad you had a good time. Please come back and see us another time. Thanks Again. Nice stop between Blue Ridge Parkway / Asheville and Cherokee / Smokies. The Blue Ridge Parkway is only 5 minutes away and is one of the most scenic drives in western NC. Downtown Waynesville (about 5 miles from Balsam) has delightful shops and restaurants, a farmers market two days a week, Barber Orchards for apples and baked goods, there is an auction on Friday and Saturday nights, 2 antique malls and the Blue Ridge Parkway for picnicking, berry picking and beautiful sights. Asheville is about 35 miles away with the Biltmore House to tour, a hop on hop off city bus tour, multiple museums and of course lots of places for shopping and eating. Near to the Smokey Mountains and Blue Ridge Parkway; also Asheville, NC, is very close. 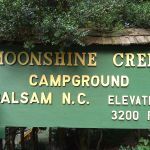 Are you affiliated with Moonshine Creek Campground ?